Access to the NASA SMAP data requires authentication through NASA’s Earthdata portal. If you do not already have a username and password through Earthdata, you can register for an account here: https://urs.earthdata.nasa.gov/ You cannot use this package without an Earthdata account. Use set_smap_credentials('yourusername', 'yourpasswd'). This will save your credentials by default, overwriting existing credentials if overwrite = TRUE. Create a text file .Renviron in your home directory, which contains your username and password. If you don’t know what your home directory is, execute normalizePath("~/") in the R console and it will be printed. Be sure to include a new line at the end of the file or R will fail silently when loading it. Once this file is created, restart your R session and you should now be able to access these environment variables (e.g., via Sys.getenv("ed_un")). Multiple SMAP data products are provided by the NSIDC, and these products vary in the amount of processing. Currently, smapr primarily supports level 3 and level 4 data products, which represent global daily composite and global three hourly modeled data products, respectively. There are a wide variety of data layers available in SMAP products, including surface soil moisture, root zone soil moisture, freeze/thaw status, surface temperature, vegetation water content, vegetation opacity, net ecosystem carbon exchange, soil temperature, and evapotranspiration. NSIDC provides documentation for all SMAP data products on their website, and we provide a summary of data products supported by smapr below. Data are hosted on a server by the National Snow and Ice Data Center. The find_smap() function searches for specific data products and returns a data frame of available data. As data mature and pass checks, versions advance. At any specific time, not all versions of all datasets for all dates may exist. For the most up to date overview of dataset versions, see the NSIDC SMAP data version webpage. #>  $ name: chr "SMAP_L3_SM_AP_20150525_R13080_001"
#>  $ date: Date, format: "2015-05-25"
#>  $ dir : chr "SPL3SMAP.003/2015.05.25/"
Given a data frame produced by find_smap, download_smap downloads the data onto the local file system. Unless a directory is specified as an argument, the data are stored in the user’s cache. #>  $ name     : chr "SMAP_L3_SM_AP_20150525_R13080_001"
#>  $ date     : Date, format: "2015-05-25"
#>  $ dir      : chr "SPL3SMAP.003/2015.05.25/"
#>  $ local_dir: chr "/home/max/.cache/smap"
The SMAP data are provided in HDF5 format, and in any one file there are actually multiple data sets, including metadata. The list_smap function allows users to inspect the contents of downloaded data at a high level (all = FALSE) or in depth (all = TRUE). To see all of the data fields, set all = TRUE. The extract_smap function extracts gridded data products (e.g., global soil moisture) and returns Raster* objects. If more than one file has been downloaded and passed into the first argument, extract_smap extracts all of the rasters and returns a RasterStack. 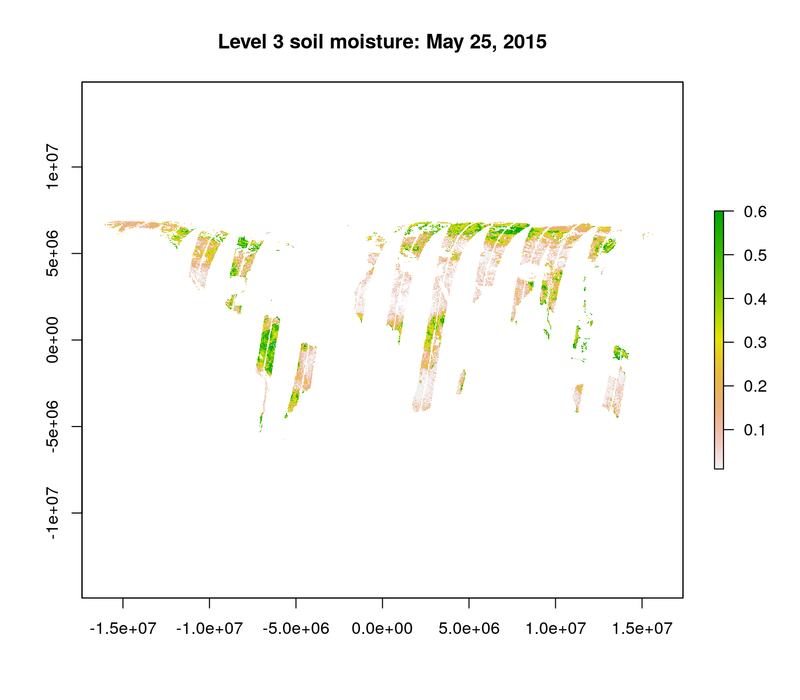 The path “Soil_Moisture_Retrieval_Data/soil_moisture” was determined from the output of list_smap(downloads, all = TRUE), which lists all of the data contained in SMAP data files. The raster stack can be saved as a GeoTIFF using the writeRaster function from the raster pacakge. Please report any issues or bugs, after reading our contribution guidelines, and the Contributor Code of Conduct. See citation("smapr") in R to cite this package in publications.